SARATOGA — Hundreds showed up to help the popular rock duo Sirsy “beat cancer like a drum,” or more simply, they showed up for Melstock! 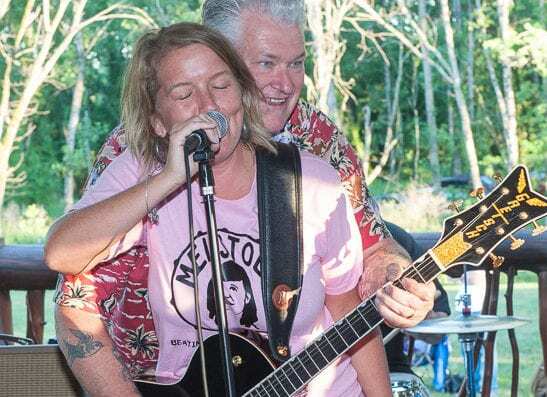 Sirsy drummer and vocalist Melanie Krahmer was home on Saturday, July 7, battling the disease with her other half, guitarist Rich Libutti, while her friends, family and fans were helping raise funds for the fight. And while the event, organized by Sircy’s rock scene colleague and friend Erin Harkes, was a lot of work for many, it proved to be a pretty good time too. The setting was a perfect summer night at a spot built for perfect summer nights – The Saratoga Winery. And the entertainment featured Ubuntu opening for the Lustre Kings – with Harkes powerful lungs standing in for at least half the songs – and then a comic lineup that included Harkes, Quentin Davis, Jen McMullen, Jim Felter, Dre Cerbin and Ryan Shanahan.